The words ‘performance’ and ‘lifestyle’ are bandied around a lot these days. They conjure up ideas of individuals making the most, or getting the most, or squeezing the most out of whatever lifestyle choice it is that they are currently pursuing. The idea of performance in contemporary society is one that might imply ‘performance indicators’ or ‘high performance’, and perhaps a sense of fitness, committed training, elite athleticism, triathlons, bodybuilding and other overachiever obsessions. ‘Lifestyle’ is one of those dirty words that I often feel a little cynical towards, especially in light of ‘lifestyle television’ or ‘lifestyle choices’, though there is no escaping the fact that we all make ‘lifestyle choices’ and live out one lifestyle or another. In the context of this research project and reflections upon the idea of portraits and personalities I think of ‘performance lifestyle’ in another manner. In particular, I think of those people who develop a lifestyle devoted to performing. Not performing in the sense of ‘in the theatre’ or “I’m a performance artist – come and watch my video” but those people who are committed to outdoors, on the street, real live, everyday type of performance. It’s the kind of performers who genuinely engage with a real public and challenge people’s day-to-day sense of what may or may not constitute reality or the norm. I’m not talking about buskers and people who pursue or expect a financial exchange. I’m talking about people who put on a show, regardless of financial outcomes. These are the people that ‘give’, culturally, on a daily basis. It’s something like the ideals of street art where art comes out of the confines of a gallery and is “just there for everybody, man”, though we all know that street art always has a bit that you can buy. Certainly, this project aspires to those big ideals and I get a huge kick out freaking people out on a daily basis. My research seems to indicate that the general public are at ease with bicycles as they know them, but they are often flabbergasted that someone might alter a bicycle in order to make it more entertaining. I love the looks that people give you – kind of variations on fear, shock, nausea, having just soiled their smalls and outright hilarity. This contorted facial expression is often combined with overall body language that indicates the viewer has just witnessed some giant glitch in the matrix that they better hurry up and photograph on their mobile device before the gaping schism in reality closes over again. (As an aside, I wonder whether contemporary Ghostbusters might simply capture supernatural nemeses on iPads.) These comments should not be read as a criticism of the general public as I enjoy acting out this cultural transaction and playing on it, I enjoy the role of performer. There are many heroes, all over the world, of the Performance Lifestyle genre and I would like to take this opportunity to tip my hat to some of the more distinct that I have encountered and enjoyed on a regular basis. Johnny Haysmann’s physical stature is dwarfed only by his legendary status as an Adelaide icon. 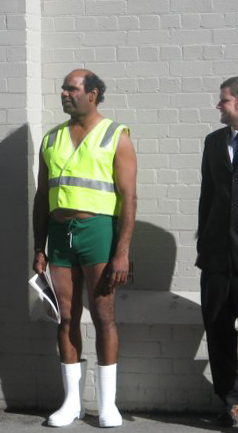 Equal parts enigma and celebrity, Johnny’s white gumboots, speedos and various array of accessories have been seen striding proudly through Rundle Mall and into the South Australian shared psyche for what seems like decades. Here is a link to his own website which offers a warm and personal insight into the man and his motivations. 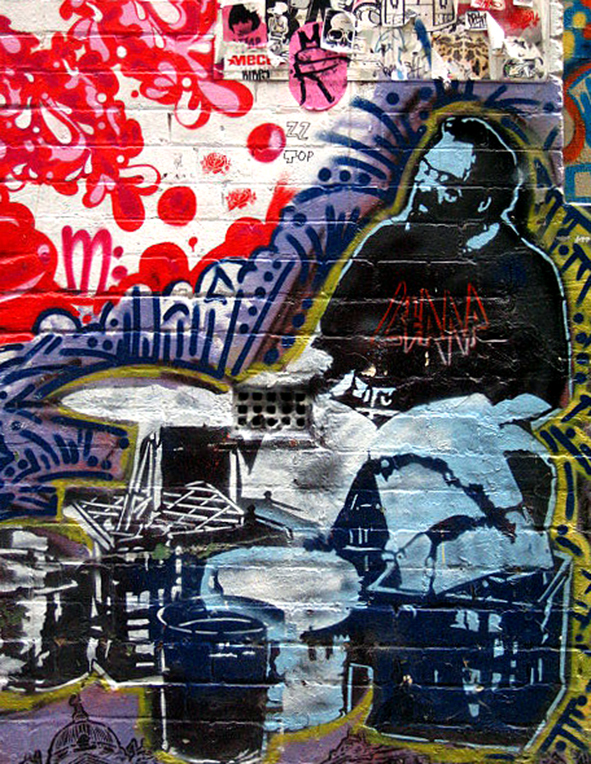 Victor Lancaster, Melbourne’s infamous bucket drummer has kept the CBD alive for many years. His beats have been celebrated on numerous occasions and made into several recordings. You can read a little more about Victor here. You simply must watch this beautiful video of Darwin’s Trevor Jenkins, the Rubbish Warrior. Trevor devotes his time to constructing ephemeral sculptures out of roadside detritus- in between running for mayor and generally fighting the good fight.